Let Railmark Track Works Inc. provide you with a Quote for the installation of our concrete crosstie ECOtie™ or our ECO-SAFE wood treated ECOtie2™ crossties or bridge members. Railmark can install its ECOdeck™ railcar liners and flooring using one of our Railmark Rail Service Centers or sending an installation team to your location’s tracks. The ECOseal™ applications are performed onsite or using one of Railmark’s facilities. Railmark has the ability to provide its customers with a complete installation and maintenance package using our products. Providing and installing the lubrication equipment and supplying our biobased lubricants for one flat rate monthly charge. No capital expenditure required. Railroad or transit crews check and maintain monthly. Railmark can provide its turnkey solution and have our crews check and fill monthly, or as needed. Railmark can provide a combination of installing additional lubricators and using its biobased lubricants for all the system with the option of providing the maintainers. Railmark can be scheduled to perform periodic switch lubrication and maintenance. Railmark has the capital to make any combination of program that best fits the needs and budget constraints of the railroad or transit agency. ECORail™ offers premium quality biobased switch lubricants, biobased hydraulic oils and biobased top of rail lubricants with superior lubricity resulting in less friction. ECORail's™ lubricants meet both the EPA’s “Environmental Preferable Purchasing (EPP)” criteria and is a USDA “BioPreferred™” produc t. Manufactured in the USA from renewable USA-grown crop-based oils with a lithium-based thickener, ECORail's™ lubricants are safe for the environment while supporting the US farmer and US small business. ECORail's™ lubricants have a higher Viscosity Index. Its base oils are 2x higher (over 200) than petroleum–based oils (95), providing more stable viscosity at different temperatures and a wider range of operation. Both tests and usage have demonstrated higher performance than many synthetics. Due to their polarity, biobased molecules bond and adhere to metal surfaces better than petroleum- based oils and greases and have a higher flash point than mineral greases, which increases safety. ECORail's™ lubricants contain no heavy metals, no chlorine and no harsh odors making them safer for the employees, the public and the environment versus petroleum-based greases and oils. 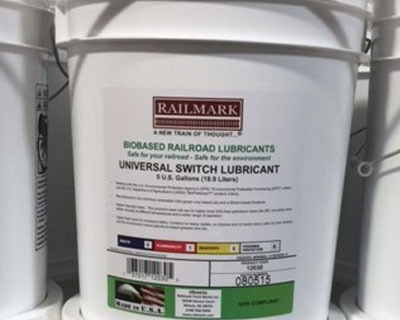 ECORail's™ offers biobased railroad lubricants including Universal Switch Lubricants, Frigid Climate Switch Lubricants, Top of Rail Friction Modifiers, Solid Stick, ISO 32 & ISO 46 Hydraulic Oils and Universal Tractor Hydraulic Fluids. A wide range of pumps and applicators are also available. Railmark sells its ECOwash™ cleaning solution for use with cleaning rail tank cars and other equipment. Through its network of Railmark Rail Service Centers, Railmark is available to establish railcar cleaning facilities or using one of your track facilities, establish a railcar cleaning function there. ECOwash™ is an environmentally safe solution for cleaning railcar tank cars and truck tank trailers for all commodities - food grade, petroleum based and chemicals. The product contains a special paraffin dispersant that provides for quick removal from the tank car walls. Works well on both steel and aluminum railcar tanks, as well as, over the road tank trailers. Our product has been tested and sold in the barge and ship industry. Depending upon the ph and other characteristics of the product being cleaned, the chemical attributes for ECOwash™ may allow for direct discharge into the sewer system. The properties that make up ECOwash™ make it safer to use by your employees and safer for the environment.